Chennai Super Kings (CSK) batsman Suresh Raina and his wife Priyanka celebrated their four years of togetherness. 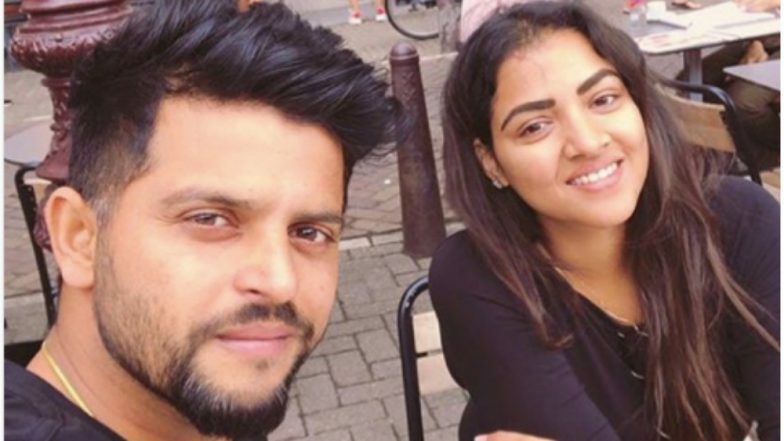 Raina in 2015 married Priyanka Chaudhary, a software engineer, and social worker, after the ICC Cricket World Cup. In 2016 the couple was blessed with a baby girl and named her Gracia. Meanwhile, the duo took to their respective Instagram accounts and posted beautiful messages for each other. MI vs CSK, IPL 2019 Match 15, Key Players: Rohit Sharma to MS Dhoni to Jasprit Bumrah, These Cricketers Are to Watch Out for at Wankhede Stadium. Around same time Raina and Priyanka posted the messages. “Today, we celebrate one of the best decisions we ever made. Today, we celebrate love & friendship. Today, we celebrate us. Thank you for being with me at every step of the way! Happy anniversary, love! @priyankacraina,” wrote Raina. “I'll find you & I'll marry you in every lifetime. Four years of being married to my bestest friend and pillar of strength! Thank you for all that you do! Happy anniversary, you! @sureshraina3,” read Priyanka’s post. MI vs CSK Head-to-Head Record: Ahead of IPL 2019 Clash, Here Are Match Results of Last 5 Mumbai Indians vs Chennai Super Kings Encounters! Raina is currently plying his trade in the ongoing Indian Premier League (IPL) season 12. The left-hander is Super Kings’ batting mainstay and is fondly called as Chinna Thala by Chennai fans. Raina recently became the first batsman in IPL’s history to complete 5000 runs. Since the inception of IPL, Raina has been part of the CSK team. During the Chennai based franchise’s two-year suspension, Raina captained now-discarded Gujarat Lions team. Under his leadership, the franchise made it to the playoffs in 2016 edition of the tournament after finishing as table toppers.